In the US video games sold on disk have to pay for a rating from the ESRB. The fees are not published but is seems that they are quite expensive and are related to development budgets. Online games do not require such a rating from the ESRB. However there is a bit of a crossover, as established online games have been creating special edition releases on disk. However the ESRB has now changed the rules and all games require an ESRB rating no mater how they are sold. Thankfully the ratings for online will be free but game producers will now have to pay for special edition releases of initially online games. The ESRB is offering a discounted price of $3000 for this subsequent rating but this still seems expensive enough to make special edition releases uneconomic. Sony has announced that it will be enforcing ESRB ratings requirements before allowing games on to its various console platforms. kotaku.com.au have cited an example where the new ESRB requirements have led to the cancelling of a planned release. Ruiner, a violent cyberpunk shooter that arrived digitally on PS4 in late September, was originally going to have a physical disc version released in the future. Developed by Reikon Games and published by Devolver Digital, Ruiner had come up on the radar of Special Reserve Games, who had previously put out physical editions of Absolver, Shadow Warrior 2, and Strafe . These packages often included not just hard copies of the game, but also art books, statues, and other boondoggles. Special Reserve Games planned to do the same with Ruiner until it became apparent that new rules being handed down by Sony would make the project prohibitively expensive. In late August, the ESRB announced a new mandate for all physical releases across all consoles would soon be required, and shortly after we announced our intention to produce Ruiner , we received word that this mandate would be applied to it and future new game releases. The process of obtaining this rating comes with a fee that puts the production costs for new releases like Ruiner out of the acceptable range for us to produce physical discs for PS4. This decision was agonizing, and we have tried multiple ways to reach a compromise, but sadly, we have had to change our plans to produce our intended collector edition PS4 discs for Ruiner . Loot boxes are a revenue creating facility where gamers are assisted in their quests by the real money purchase of loot boxes that contain a random collections of goodies that help game progress. 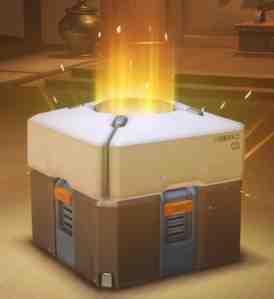 loot boxes are found in many commercially successful games, such as Overwatch, Call of Duty: Infinite Warfare, Halo 5: Guardians, Battlefield 1, Paragon, Gears of War 4, and FIFA 17. The pros and cons of this method of revenue raising has been passionately debated in games forums and teh debate seems to have widened out to more regulatory spheres. Last week the Entertainment Software Rating Board (ESRB), who rate games for North America declared that loot boxes, despite their inherent randomness, do not constitute a form of gambling. The reason, simply put, is that while you don't know what you're going to get out of them, you know you're going to get something -- unlike a lottery ticket, say, where the great likelihood is that your money is just going up in smoke. In short, our approach is similar to that of ESRB. The main reason for this is that we cannot define what constitutes gambling, That is the responsibility of a national gambling commission. Our gambling content descriptor is given to games that simulate or teach gambling as it's done in real life in casinos, racetracks, etc. If a gambling commission would state that loot boxes are a form of gambling, then we would have to adjust our criteria to that. Loot boxes are already covered by and fully compliant with existing relevant UK regulations. The games sector has a history of open and constructive dialogue with regulators, ensuring that games fully comply with UK law and has already discussed similar issues as part of last year's Gambling Commission paper on virtual currencies, esports and social gaming. To ask the Secretary of State for Digital, Culture, Media and Sport, what steps she plans to take to help protect vulnerable adults and children from illegal gambling, in-game gambling and loot boxes within computer games. To ask the Secretary of State for Digital, Culture, Media and Sport, what assessment the Government has made of the effectiveness of the Isle of Man's enhanced protections against illegal and in-game gambling and loot boxes; and what discussions she has had with Cabinet colleagues on adopting such protections in the UK. It seems that the Isle of Mann already sees loot boxes as being liable to gambling controls. So for the moment it seems that for the moment the status quo will be maintained, but in this age of cotton wool and snowflakes, I wouldn't bet on it.